Research Eyes | Thoughts of a scientist on science and science policy. Or, research thoughts and meta research thoughts of a researcher. It’s been a year since my last post. On July 9, 2013, I learned that a grant was not funded. On July 11, 2013, I learned that my contract was contingent on that grant. My contract had a year left on it. My husband hadn’t found a job in Kirksville during the 3 years we’d been there, so he applied for jobs in Columbia and immediately got 2 offers. We moved to Columbia and I finished out my contract working from home. My contract ended June 30, 2014. I’m not a scientist anymore! Since I started bicycling for transportation 10 years ago, I’ve been tempted to change careers. As my dissatisfaction with academic research failed to decrease, and my interest in traffic and transportation increased, this made more and more sense. But with my husband in school and then unemployed in Kirksville, we were dependent on my paycheck. There wasn’t a good time to jump ship. When I got the news that my contract wasn’t going to be renewed, I was almost relieved. And when my husband got a job, I was ecstatic. Finally, I have the opportunity to switch careers. I enrolled in an online Master’s Program in Sustainable Transportation through the University of Washington. My career in academia was a disappointment. Through my involvement in the National Postdoctoral Association, I wanted to help drive change, but I was teeny tiny ineffectual cog in a huge broken machine. I thought my position at a private osteopathic medical college would be different. It’s a private institution and so not constrained by tax funding. It’s an osteopathic medical college and so has to think outside the box. And it was different. But in the end, it was still unsuccessful. Some might argue that it was me. A better person would have succeeded. I disagree. I’m a smart cookie, an educated and competent cookie. I lacked the resources I needed to succeed in the time frame I was given: I was expected to have external funding in 3 years. In the current funding climate, that is an unrealistic expectation and it was not made clear to me up front. I knew I was expected to seek external funding. I did not know I was expected to have it in 3 years. However, I don’t mind that it turned out the way it did. I felt an obligation to try to make a go of it, to try not to waste the PhD and the long miserable years of postdoc servitude. I realize now that that attitude is one of throwing good money after bad, only it was the good years of my life I was throwing after bad years. There were some parts I loved. I don’t miss those parts, because I can keep those elements in my post-science life, just not in the same way. For example, I won’t be reviewing NIH grants, I’ll be reviewing plans for a bicycle path. I admit I do get a certain amount of satisfaction in saying, “I was a biomedical research professor,” instead of saying, “I was in biomedical research,” as I would have said if I had left during my postdoc years. I’m tempted to end this journal with the excitement and optimism I feel about my new career, but I will refrain because it is not part of this story. Let’s just say that Research Eyes is in a better place. This week I faced a little bioethics dilemma. I needed to test my primer pairs before I ran my precious samples. It would be best to test them with freshly isolated RNA, since if they failed I would have more confidence it was the primer pairs that failed, not the fact that I had bad RNA. So I went up to the rat room, got a rat, sacrificed it and took out its spinal cord. I took the tissue back to the lab and started the RNA isolation. Then I made a mistake. I have been using the RNeasy kit for lipid-rich tissues on my RNA isolations. I use Qiazol for the lysis buffer. Both RNeasy and Qiazol have protocol cards and I was looking at the Qiazol card instead of the RNeasy card. The moment after I did the first step on the Qiazol card that is different on the RNeasy card, I realized my error. But it was too late. I continued on with the Qiazol method. Was my RNA any good? I could proceed with the RT-PCR, which takes several hours and reagents that aren’t cheap. Or I could assume it was no good and go get another rat. This rat came out of the colony and I have it to spare, so the only consideration is that the life of the first rat would be wasted. I’m sure many (most?) scientists would laugh at such a consideration. Grant money and limited reagents are far more valuable than a rat. I went ahead with the experiment. Most of the primer pairs I was testing did work, so this experiment was a success. Of course, it dawned on my later that I should have run the RNA on a gel. I don’t like to do that because I’ve had good RNA that looked bad because it degraded on the gel. It’s time consuming enough that I don’t really think it’s worth it. However, it was probably worth one rat’s small life. By the way, I felt no guilt at all for making the mistake in the first place. These things happen to even the most experienced and careful of scientists. It is wise to factor in the mistakes in the planning. We even factor it into the rats. We order 10% extra for unforeseen circumstances: mistakes, a rat dies unexpectedly, or a blizzard keeps us from getting into the building to do the experiment. Authorship is a hot topic in bioethics classes. How to settle authorship disputes. When you did the work to merit first-author but the student who comes after you and “needs” the publication more urgently gets first-author billing. When the wife (or girlfriend) of the PI gets authorship because she worked in the lab for 2 weeks once, spilling reagents and making messes. When the department chair gets authorship on all papers that come out of his department, even though he contributed nothing to them. When the person who provided funding for the research gets authorship, even though he contributed nothing otherwise to the project. Authorship has come to my attention because I just got a paper accepted into a journal and I had to go around collecting author signatures. I even had to get permission from everyone listed in the acknowledgments to be so listed. If I had realized how challenging those 2 steps would be, this paper would have had fewer authors and fewer acknowledgments. It came to my attention again when a poster abstract I submitted for a meeting turned out to require signatures from all the authors. I found myself wondering why we had so many authors. There aren’t any clear guidelines on how to figure out who merits authorship. One rule is that only someone who made an intellectual contribution should get authorship. That takes care of the wife of the PI who spilled reagents for 2 weeks and the departmental chair or someone trying to push his weight around. It seems a bit unfair to the lab tech who ran a ton of routine assays. Can you really say that she didn’t contribute intellectually? Troubleshooting the assay and learning it seems like an intellectual contribution. The argument is that you could have contracted that out to any other lab, so it’s not an intellectual contribution. Any trained monkey could have done it. Well. I bet the PI couldn’t have done it. Everyone listed on my poster abstract did contribute intellectually, and in retrospect I wish we had included the lab tech, because there was some troubleshooting and study design that he was involved in. Oh well, he’ll be listed in the acknowledgments, and the manuscript is more important, and he’ll probably write part of the methods so he’ll be a co-author when/if we write the manuscript. At what point is a contribution substantial enough to merit authorship? Acknowledgments are even murkier. The summer student who ran a few statistical analyses didn’t seem, in my opinion, to have earned acknowledgment. I’m not entirely sure we used his statistics in the end. I think we re-ran everything before it was all said and done. But I guess he did some of the original analyses, and statistics is a big mysterious gray cloud to me, so maybe he had some other insights that were critical that I’m not aware of. The biggest issue with acknowledging him is that it was a challenge to track him down to get his permission to be listed! That raises another point: there was a lot of work done before we started collecting data and was included in the manuscript. We tried a bunch of stuff that didn’t work at all before hitting on the thing that sort of worked (but not really). We did acknowledge the student who did all the stuff that didn’t work. The other questionable acknowledgment was a professor who had moved on to another university. In fact, he was surprised he was being listed in the acknowledgments, so minor were his contributions to the original study design many years ago. At what point is a contribution substantial enough to merit an acknowledgment? A related question is how long do you continue to list someone as a co-author when they made a contribution that is something you now routinely use? The creators of the ERKO mouse got listed on every manuscript that used those mice. They’d send a few breeders to a lab, and all the papers that came out of that lab that used the ERKOs would list them as co-authors. Or suppose someone sent me a protocol for an assay that their lab had developed. Do I list that person as an author? That’s definitely an intellectual contribution. Would I continue to list that person(s) as authors on every paper where we used that assay? As a junior faculty, I let myself be guided by my more experienced colleagues. I watch and I learn. As a result of my experiences this week, in the future I’ll be more careful who I list as an author. Of course I don’t want to fail to credit anyone, but co-authorship is like grade inflation. If it’s too freely given out it’s meaningless. In retrospect, I’m inclined to think that anyone listed as an author should, in addition to having contributed to the research design or whatever other aspect of the project, have contributed to the publication or poster abstract. That doesn’t mean they need to have written a section of it, but they need to have read it and provided substantial feedback. What is substantial feedback? I’ve gotten feedback from so-called authors that was embarrassingly minor. I’ve gotten feedback that was grammatical! I have a science writer for that, and she gets acknowledged for her assistance, not authorship. Substantial feedback requires careful reading and spending some time thinking about it. When I get grammatical corrections (which are often wrong), I know that the “author” rushed through the job. Of course it would be best if I mentioned up front that was my expectation, and then there could be decisions or negotiations ahead of time and no surprises later. When I’m grown up a midlevel professor with control over authorship on my own papers, my threshold for who gets co-author billing or acknowledged will be a bit higher than it seems to be for my colleagues. This manuscript has 8 authors. Presumably each of them could use any part of this manuscript in another manuscript and it would be self plagiarism and therefore not plagiarism. Suppose one of them writes another manuscript that has other authors on it and one of the others authors wrote a 3rd manuscript that has that sentence but does not contain any of the authors on the 1st manuscript. Would that be plagiarism? Do you get to inherit words in that way? With the example sentence I gave, no one would care. But you can easily imagine the 6 degrees of separation causing a self plagiarism problem at some point. This is standard language and this sentence or something very similar to it should be included in any publication of animal experiments. Most journals require it. There’s only so many ways to say it. I doubt that I created that sentence. I don’t know where I got it from, but probably something along the lines of the 6 degrees process I described above. There’s only so many ways to say it, and if you get too creative, someone looking for that particular sentence will have problems finding it, which could have regulatory implications. Well, I’ve enjoyed this little interlude in writing my manuscript. I have not resolved anything, but I have succeeded in a spot of procrastination. This is the 4th time I’ve served on an NIH study review session, specifically for NCCAM and for the “other” funding mechanisms (ie, not R’s, except for the R15s). Someone asked me why I am doing it. It does take a lot of time! But there are many good reasons. 2. I want to learn the current culture so I can be part of the changing culture of science. One could say after 3 study sessions that I’ve probably learned and maybe don’t have a great deal to learn from further experience. True. And yet, I can become quite intimate with the process and keep abreast of the changes. 3. And I can be part of the changes. Even first time young reviewers can change the conversation. I did. For my first study section I did my homework–I read all the materials. I wanted to do a good job and I had never done this before. (I probably did better at that first one than at some later ones.) I noticed that the objectives of the AREA grant mechanism was to promote research at smaller institutions with traditionally less NIH funding, and to encourage undergraduate research. That second item was missing from a lot of the AREAs that we reviewed and I pointed it out. Some of the AREAs were resubmissions, and the original reviewers had missed that too. At the next study section, everyone was pointing out “undergraduate research” (if it was missing), and more of the grants being submitted addressed undergraduate research. Another newly minted professor mentioned “childcare” on all the conference grants. Next thing you know, everyone is looking for “childcare” when they review conference grants. I want to be part of the solution, or part of the precipitate, whichever. 4. I want an AREA grant myself. So as I review the AREA grants, I pay special attention to what reviewers are saying about them. Particularly the ones that don’t score very well. I know what the weaknesses will be when we submit ours. I’m thinking ahead to how we’ll overcome those. “Modest publication record” can be shored up with collaborators who have “robust publication records”. Forming a solid research plan and communicating “innovation” and “significance” to the reviewers can be achieved by having lots of people read over the grant before I submit. But there is no way to compensate for lack of preliminary data. That is the main thing we need to focus on. Another observation I had during this meeting is that new applicants could really benefit from increased support for grant writing. Perhaps a system could be implemented where a first-time applicant has an earlier deadline, but their proposal is pre-reviewed and they have a chance (maybe a couple weeks, or a month) to improve it. Especially for conference grants, which are perhaps more likely to be written by someone who hasn’t applied for NIH or federal funding before. The pre-review could be one NIH person (like a program or science review officer) and/or an official reviewer (someone like me, only preferably with more experience reviewing a conference grant). It needn’t be a detailed in depth review, but a cursory look over to get the big problems. It could be piloted as an optional early pre-review deadline, and maybe become mandatory for applicants who have never applied for NIH funding plus optional for anyone who has never applied for that particular mechanism before. Finally, a bit of reviewer humor and a spot of sympathy for our poor Science Review Officer (SRO aka He Who Must Not Be Named). The SRO gives us lots and lots of instructions. The last couple study sections I’ve served on, he asked us to pay attention and participate and go easy on the checking email & facebook and ordering guitars. That’s right, someone ordered a guitar online right there in the middle of a study section. I admit I kept my facebook page up all day. But I didn’t let it distract me. I can quit anytime. I’m a functional facebookie. Really. So he told us the guitar story again and I asked “What kind of guitar was it?” (Just to be snarky, because I like being snarky.) (It was an acoustic guitar.) 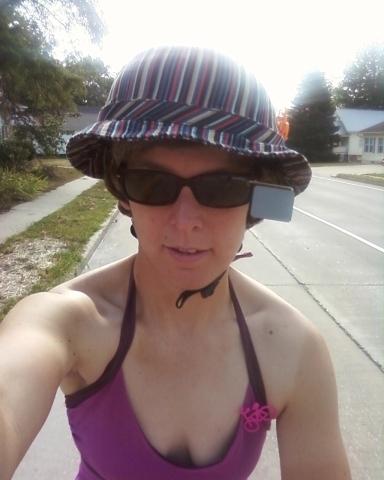 Later I told him, “The last study section I was on, when you told the guitar story, I immediately got online and bought a bicycle helmet.” It’s a cute helmet too. I went to a health talk last night from a woman who has what I will describe as a whole-person clinic. She is a chiropractor, and other services at her clinic (offered by other professionals) include counseling, acupuncture, yoga, herbal medicine, etc. I really want to give these types a place at the table on science & medicine discussions. I have a hard time taking them seriously when they say that an alkaline diet cures cancer, or that arthritis starts in the bowels. They have a tendency to grab onto some science report they read and run with it. Maybe they read that inflammatory molecules are found in arthritis, and then they read that casein (a milk protein) induces cells in the lab to secrete some molecule involved in inflammation, and they leap– they bound– to the conclusion that casein–> inflammation, inflammation–> arthritis, therefore milk –> arthritis. I’m not saying that milk doesn’t cause arthritis. I really don’t think the evidence is strong on that– or many of the other supposed health adversities of dairy. The problem is that the evidence isn’t strong enough for so much of what they say. Because we don’t have good strong evidence yet, the only way to find out if milk is causing your problems is to experiment on yourself. Maybe these quack-docs did that. They have good strong evidence that milk is associated with their own problems. That is still an n=1 and doesn’t mean that it is true for anyone else. The evidence IS there for many things, like exercise, sugar, and sleep. She did tout exercise and sleep and disparaged sugar, but it was so mixed in with all this other quack-science that it lost its impact. She paid lip service to “I can’t tell you what’s right for you” but then she went on to do just that, and if anyone disagreed with her she started in on “compromises” whereby the person would come around to her way of thinking. Not everything she said was wrong. Most of it was standard health advice. I was glad to hear that she put sleep as #1 priority driving all other health habits. I like to say “sleep is the new vitamin”. It wasn’t very inspirational, at least not to me. Except for her quack diet, I practice the things she was encouraging, probably more so than she does herself. She doesn’t bike to work anyway. I don’t think I was her target audience, nor was I representative of the majority of people sitting in the room. While I think it is quite a stretch to say that all diseases start in the bowels, I agree that poop is important and interesting. One thing she said, however, not only did I disagree with, but it made me quite angry. That was the bit about alkaline diet and cancer. That is the one of the most thoughtless, rude, and hurtful things anyone could say. You are telling people that if they just eat an alkaline diet their cancer will go away, or if they had eaten that diet all along they wouldn’t have cancer. People with cancer get barraged with information from well-meaning friends and family about this miracle plant or that which is supposed to cure them. They don’t know how to sort out what’s real and what’s not. They end up feeling guilty for having cancer. I’m sad that the concept of “whole person healthcare” can’t get out of the realm of quack medicine. If you are truly looking at the science, it’s obvious that there is something to whole person healthcare. Neither model– not quack medicine and not traditional medicine– is correct. Diabetes is not just a disease of the pancreas. It’s not just a disease of obesity either. It’s bigger than the pancreas, bigger than the fat, bigger than the individual. It is a part of community and the fact that there is one centrally located grocery store to serve a 5-mile radius. (Where we used to live, we had our choice of 2 grocery stores– located across the street from each other, both of them serving the same 5-mile radius.) It’s our social network that assumes a car and assumes driving and treats exercise as something separate and optional to lifestyle, something done by health nuts, an all-or-nothing proposition. It’s the unregulated advertising and marketing and ubiquitous sugar injected into all our food. It’s all wrapped up in all these things and the individual suffers not just the disease but the social stigma of having failed his responsibility to his health. There is absolutely nothing there to encourage or even make it possible to change his lifestyle. That’s just one example. I don’t know exactly what whole person healthcare looks like or what health care providers should be doing differently than what they are doing now. They should be asking questions about more than just the presenting ailment. They should be listening to the patient. The patient should be the primary decision maker and the health care providers–yes, even the doctors– are advisers. Speaking of the patient as the primary decision maker, Dr. Google & I successfully diagnosed and treated my lower back strain in January. We concluded that it was probably a bad strain that would get better on its own over time. We admitted the possibility that it could be a ruptured disk, because a) the treatment is the same (it’ll get better on its own) and b) the symptoms matched up somewhat. We rejected the possibility of a slipped disk because a) that would be horribly inconvenient and b) the symptoms didn’t match. After it did get better on its own, we retrospectively diagnosed it as a bad strain, and not a ruptured disk. This approach involved a daily walking test and a daily stair test so that I could track my improvement. The follow-up is to work on core strength so that this never happens again. I felt it was remarkably successful and I will continue to use the Dr. Google/ self diagnosis approach for my medical care. The tracking is key, an objective measure. Lots less worry that way. I just finished Isaac Asimov’s last autobiography, “I. Asimov”. I want to share this passage (page 163) because it is sadly familiar. This situation is well known to anyone who has experienced academic research. What was interesting to me is how the situation in 1950 matches the situation today. “I had left one factor out of my calculations. Lecturing helps only the students. Research, on the other hand, means government grants, and a portion of the grants is invariably marked for “overhead”, which goes to the school. What it amounts to is that the school chooses research over lecturing every time–money for itself over education for its students. That meant I was not invulnerable at all, but rather a sitting duck once my research vanished altogether, which it did. Ultimately he was fired. Everyone agreed he was an excellent teacher. In addition to teaching he was a prolific writer–and not just science fiction. He thought that science writing would fulfill the “scholarship” arm of teaching-scholarship-service. He scaled back on his fiction writing while he was receiving a salary from Boston University, in order to fulfill that commitment. But it wasn’t good enough and he was fired. He was describing his 9-year stint as a professor from 1950 to 1959. Sadly, nothing has changed. Well, if it has changed at all, it has only gotten worse. I think my institution is perhaps a little better about this because they do not get much money from research grants. In fact I’ve heard complaints that they do not value research enough, and I worry a little about my own position. My position is 100% research, 0% teaching, unless I want to teach, and then I’m allowed up to 10% teaching, but it is discouraged. If the institution doesn’t value research, how secure is my 100% research position? (I don’t worry about it much.) However, I don’t think they value and reward teaching prowess either. I’m not entirely sure about them actually. I haven’t quite figured them out. Regardless, in general, and certainly at most other institutions (even, to some extent, liberal arts colleges), there is simply not even a pretense of caring about teaching quality. If you have grants, all is forgiven. A professor can be the worst teacher ever. S/he can go so far that there are lawsuits, and all that is done is to rearrange the schedule so that you don’t teach certain students. There is not the slightest attempt to “strike a balance”. Far from it. Check out the #overlyhonestmethods twitter hashtag. In addition to being humorous, #overlyhonestmethods tweets provide insight into the real world of science. Science is “supposed” to be about carefully controlled conditions. We contrast what happens in the laboratory to what happens in the real world to illustrate that the real world has many variables and unpredictable conditions. But scientists are real people and the laboratory is a place in the real world just as much as any other place. When we write up our data, our description of the methods we used is typically cut and dry. We only explain why we selected the details if something diverges from what most other scientists do—or if the reviewer asks why. Here are the real reasons behind the methods. Scientists are human, with human needs. Unsurprisingly, trainees are more prone to mistakes. When scientists don’t have the resources they need, they get creative. Sometimes they simply don’t have enough resources. “we didn’t read half the papers we cite because they are behind a paywall” The paywall limitation came up a lot. Most people are not aware of how hidden much of science is. Your taxpayer dollars don’t buy you the right to learn the results of the science you funded! Recent legislation decrees that any publications resulting from research funded by the government must be made publicly available, so this limitation is changing. Or they have some resources but not quite enough. “Only the descriptive statistics are presented, b/c I don’t know how to analyse data that is not normally distributed.” Google it! Ask someone! Take a class! But sometimes they have too many resources. Sometimes we realize that we haven’t really known why we were doing what we were doing. This is my favorite #overlyhonestmethods. Rather than work out every method anew, researchers rely on scientists of the past who—we hope—optimized the method. Scientists are subject to the vagaries of the real world. Scientists lose faith in science all the time. Finally, scientists just wanna have fun. Some might decry the waste of taxpayer money when scientists make mistakes, but no one is more frustrated than the scientists, whose careers depend on lost data. If we want scientific progress, we have to accept that mistakes are part of that. And how else would we train the next generation of scientists if we don’t allow them their share of newbie errors? I’m scanning 9 microarray slides. I put a slide on the scanner, hit “prescan” and read a crazyguyonabike journal for about a minute. When the prescan is done, I adjust the area and hit “scan”. I set my timer for 3 minutes and go down 2 flights to my office to get real work done. When my timer goes off I trudge 2 flights upstairs, which takes me longer today because I messed up my back. I load the data file and tell it to align the spots. I read another 60 to 90 seconds of crazyguyonabike journal while it does that. I tell it to adjust the laser intensities (at least I think that’s what I’m telling it) so that the red and green are roughly equal. I set my timer for 10 minutes and head back downstairs for some more real work. When my timer goes off, I go back upstairs, analyze the results and read another 60-90 seconds of crazyguyonabike journal, save the results, and put the next slide in. After a few slides, I stay upstairs for the 3 min (actually 5 min but it takes a while to get up the stairs) bits and I reduce the 10 min bit to a 9 min bit because it takes me so long to get up the stairs. In addition to reading crazyguyonabike journals I contemplate what food I’ll eat during my 9 minutes in my office while doing real work. Or pretending to do real work. It is not surprise that after several days coke-free I succumb and get a coke and a candy bar from the machine. But boy howdy are they freaking delicious after all that anticipation. What is a surprise is that I reconcile my records with the quarterly grant report, I send a few important emails, and I finish and submit my ACUC 3-year renewal application with attachments. I’ve been at this for hours. Suppose you gave everyone a deck of cards. The deck only has 5 cards: an ace of hearts, and 4 clubs. Everyone draws one card. Each person’s risk is 20%. It doesn’t matter what card the guy next to you drew. You still have a 20% risk of drawing the ace of hearts. Our fictional speaker believes that there is only one deck, and 20% of the deck is aces of hearts. If the guy next to you drew the last ace of hearts, your risk is 0%. Or if you are drawing the last card, and all but one of the aces of hearts have been drawn, and all the clubs have been drawn, your risk is 100%. When we think about individual risk, everyone has been given their own deck of cards. But we don’t all get the same deck. Age, inactivity, obesity, smoking, family history, gender, geography, and ethnicity are risk factors for heart disease that stack the deck. I’ve dealt myself more clubs by bicycling for transportation. Each year I age, I get more aces of hearts in my deck. There is at least one ace of hearts in everyone’s deck. Any piece of equipment can malfunction, we all have one and only one heart. Some of us have 3000 clubs or 3 million clubs, but even so we can still draw that one ace of hearts. Some of us have 9 aces of hearts and only 1 club, and manage to draw that one club. So a better educated seminar speaker, first of all, wouldn’t claim that 1 in 5 of us will die of heart disease when it’s actually that 1 in 5 of us will merely have heart disease, and second, wouldn’t say that “4 of you will have heart disease” to a room of 20 people. Our speaker could more accurately say to an audience of 20 million that “4 million of you, give or take a couple standard deviations, will have heart disease”. Any speaker worth her salt (or salt substitute) would go on to describe the lifestyle changes we can make to stack the deck in our favor. Go ride a bicycle. You can put the cards in your spokes.